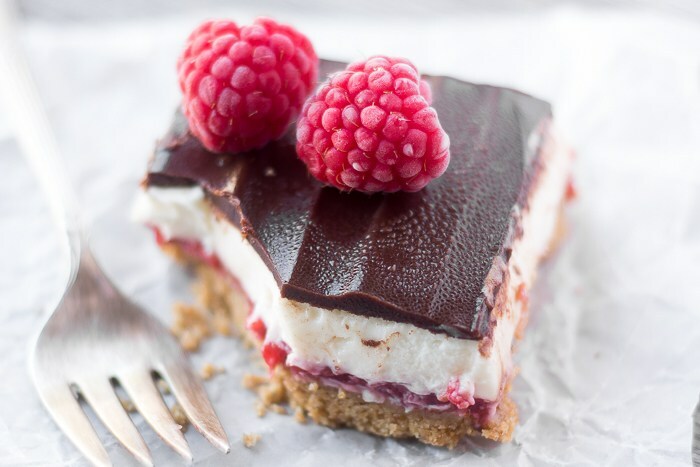 No Bake Raspberry Cheesecake Bars have a graham cracker crust, a layer of fresh raspberry, a fluffy cheesecake filling, and a dark chocolate top, yum! I lightly spray and then line my 9x9 square baking pan with 2 criss-crossed sheets of parchment paper, with long ends hanging over the sides. This is totally optional, but it allows me to remove the chilled bars and cut them more easily. Crush the graham crackers into a fine crumb. I do this in my food processor. I find that it helps to break up the crackers a bit first before adding to the machine. Pulse in the sugar, and then drizzle in the butter and process or mix until all the crumbs are moist. Pat the crust evenly into a 9x9 square baking pan. Pop this is the refrigerator while you make the fillings. Put the raspberries, sugar, and cornstarch in a small saucepan and bring to a boil. Lower the heat to medium and cook this mixture for about 2 minutes, or just until thickened, stirring often. Add a touch of water if it seems very dry, and mash the raspberries a bit as you stir. Remove from heat and let cool for 15 minutes. Spread the cooled raspberries over the crust and put back in the refrigerator. Whip the cream to firm peaks in a small bowl. In another bowl beat the softened cream cheese with the sugar and vanilla until smooth. Fold in the whipped cream gently. Spread over the top of the raspberries. Chill for an hour. Melt the chocolate with the butter and stir until smooth and silky. You can do this over the stove or in the microwave. Set aside and let cool for 10 minute. then drizzle over the top of the cream cheese, using an offset spatula to gently spread it over the top. Refrigerate for at least 2 hours before serving.